Winter in London is Baltic. There is no way to dress this. Today, I am cold, congested and somehow managed to scrape my back on some sharp object. This may be the most pitiful recipe to date. Butternut squash is a great flu-fighter: this orange hued wonder is rich in antioxidants and vitamins B and C- wonderful for when you're feeling under the weather! I added spicy roast chickpeas and squash seeds to add some texture. This subtly spiced soup does feel like a cuddle in a bowl. 1) Preheat the oven to 200C/180C fan/gas mark 6. Peel, dice and chop all the vegetables. 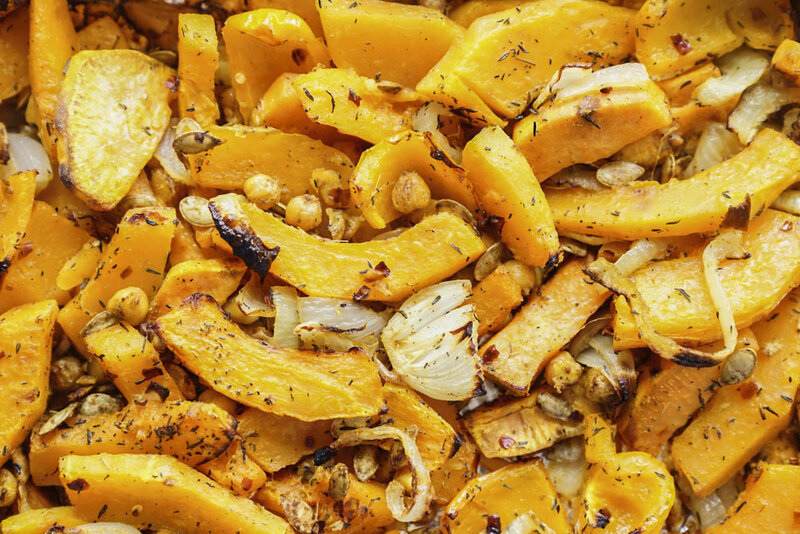 Prepare an oven tray; drizzle with olive oil and seasoning before roasting for 30-40 minutes. 2) In a pan over a medium flame, boil the vegetable stock for 10 minutes or until the granules have dissolved. Add coconut milk a spoonful at a time to achieve a thick, creamy broth. 3) Remove the roast vegetables from the oven and transfer a few spoons of the veg with broth into a blender. Blitz in batches. Keep some of the chickpeas aside if you like soup with texture. 4) Serve hot with toppings like chickpeas, crunchy sunflower seeds or sesame. Soup lasts 3-4 days in the fridge so it's a great idea for quick lunches.